At amazon.in you can purchase Pedigree Dry Dog Food, Meat & Vegetables for Adult Dogs – 20 kg for only Rs. 2,430, which is 13% less than the cost in Snapdeal (Rs. 2,799). 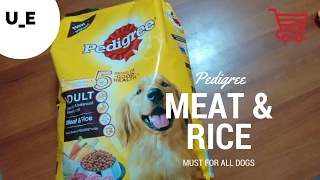 The lowest price of Pedigree (Adult - Dog Food) Meat & Vegetables, 20 kg Pack was obtained on April 22, 2019 1:38 pm. You’re sure to see 5 SIGNS OF GOOD HEALTH in your pet – healthy skin & coat, strong bones & health, firm stool quality, strong muscles and cheerfulness – keeping him active and happy right through the day! Developed by the Waltham Centre for Pet Nutrition, a leading scientific authority in pet nutrition and well-being for over 50 years. Give your dog a meal packed with vitamins, zinc and omega 6 to help keep him looking like a best-in-show winner! I dont even try any other flavour now. My lab loves this. Cloudtail makes sure tht u recieve fresh product. Excellent quality……… Thank you sellerExpiry date too long..! The Pedigree Adult Dog Food supplied was very fresh and latest production and reached intact. I have Labrador of 14 months and having 38 kg. This pedigree food he likes very much. He is always waiting for this. I think nothing extra good needed if this food is given. Thank you and I recommend this food. My dogs made lot of difference in terms of muscle built fur n health on using meat n rice of pedigree. For best taste give them gravy mix of pedigree along with this food. I’m sure your dogs will love it. First of all the package was damaged(2 holes by rats)… secondly My Labrador and GSD don’t even touch this food even after adding chicken gravy,eggs and lots of effort… A complete waste of money for me..